associated with sacrifice, danger and courage heat, fire,beauty,activity, passion, sexuality, anger, love, and joy. In many Asian cultures, it is the color of happiness ! 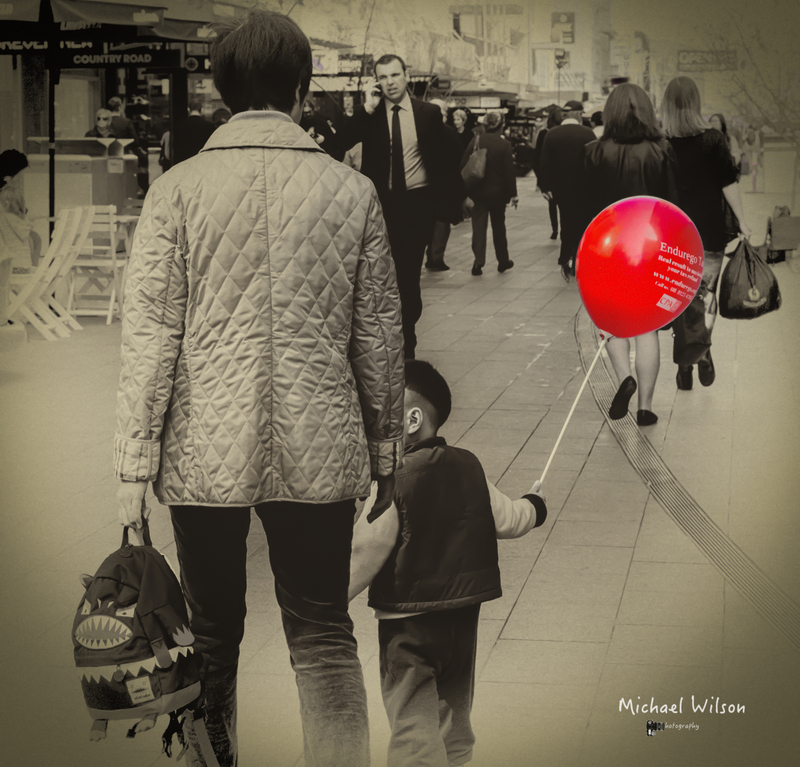 This entry was posted in Photography and tagged Adelaide, Adelaide Street Photography, Balloon, black & white, colour, happiness, Lightroom, Monochrome, People, Photography, Red, Silver FX Pro. Bookmark the permalink. The red matches the anguish on the face of the guy on the phone. Thank you for your wonderful comment I enjoyed reading it very much. I agree a colour can say so much and have many different meanings. Don’t worry it was one of the first things I thought of ! Love this Michael. so different than your posts. I live in a red room, it is one of my favorite colors and denotes warmth, love and passion! Kathryn, thank you, it is always nice to be surrounded by warmth, love and passion. Its amazing how colours can evoke emotions in us all and red is certainly a colour that can do that. I tried to post this comment “I am so, so sorry to read this! I wondered where he was but thought perhaps a hiatus. His comments were always uplifting and kind. Dear man. ” but it seems that the comments are closed. He was such a kind, creative man ! Yes I really do miss presence here, he made a difference in peoples lives.